"In Norse mythology, the Bifrost was the rainbow bridge linking the realm of the gods to Earth. At UC Santa Barbara, it is also the name of the Broadly-tunable Illumination Facility for Research, Outreach, Scholarship, and Training (BIFROST), a laser facility that will provide coherent light throughout the visible and infrared spectrum to 10 laboratories in the campus’s Broida Hall, which houses the Department of Physics. Like the mythical bridge, BIFROST includes light at many different frequencies; unlike its more ephemeral namesake, it offers high-quality, tunable light, and is easily accessible to mortals. “This is something that we felt could really turbocharge a lot of different areas of research,” said David Weld, a professor of physics, who led the effort to bring the unique apparatus to the campus. 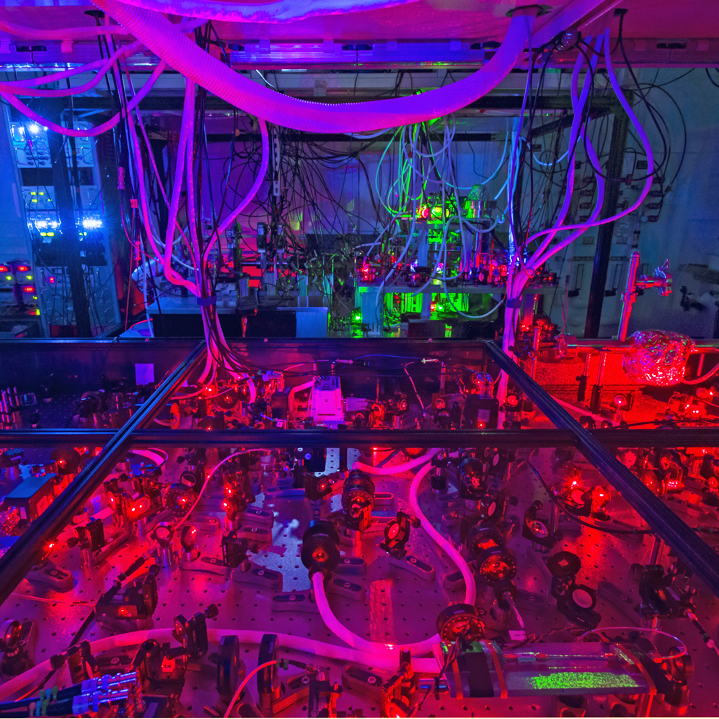 Consisting of a titanium:sapphire laser with harmonic and sum frequency modules, and housed in its own central room in the building, BIFROST delivers laser light to several labs via a network of dedicated optical fibers. When the project is complete, individual research groups working with one or multiple specific frequencies of light will be able to conduct their studies efficiently, using a remote web-based interface to tune the laser, according to Weld. Condensed matter physicists can use the laser to explore the quantum mechanical properties of solids. Biophysicists can observe processes in individual molecules. And with the fine control provided by BIFROST, atomic physicists like Weld can precisely probe optical transitions. “If you want to drive particular transitions, then you need light of very specific colors,” Weld said. “And if you want to do it precisely, you need that light to be spectroscopy-grade.” Until BIFROST, expensive, individual devices that provided one color or another were necessary; with this “light-faucet,” not only will existing research be boosted, but new areas can be opened up. He added that the multi-user tunable spectroscopy-grade laser can also provide learning opportunities not always available to beginning physicists — namely, undergrads who can get an edge in their research and study with access to such an instrument. “The inability to get well characterized laser light of a particular frequency is very often the barrier that prevents an experiment from being feasible in the undergraduate labs,” he said. And it couldn’t come at a better time. UCSB has one of the fastest-growing populations of physics undergraduate students in the nation. Additionally, it is a minority-serving institution, a designation that enabled funding for BIFROST from the U.S. Department of Defense and the Army Research Office. The breadth of ongoing and future research the instrument can support and the opportunities it provides for education and STEM outreach, Weld noted, made the campus an ideal location for the half-million-dollar facility."